This hamburger is about to be eaten. It took me two minutes to do so. It’s based on a recipe by James Beard. The ground beef is mixed thoroughly with half a grated onion, about 2-3 tbs heavy cream, and freshly ground pepper. It’s then cooked in butter and oil over high heat in a cast iron pan for about 5 minutes a side, so that it’s totally seared on the outside and very rare in the inside. As you can see, it’s served on a buttered English muffin. No condiments are needed – just salt and maybe a slice of onion. It’s buttery, onion-y, fatty and heavy. I ate it with a side of boiled, buttered green beans. I think now I’ll have a Tahiti cookie for dessert. 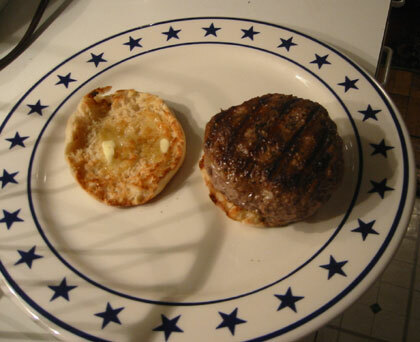 what is it about hamburgers on english muffins? more importantly, what did you pair with that puppy? I don’t know, but I first had them at McBell’s on Sixth Avenue back in the old days. I wasn’t surprised to find that James Beard did them that way too. The pairing was Heineken. when i was a kid, my mother would take me to work with her in then primordial tribeca, and one of the highlights–not including running thousands and upon thousands of computer punch cards through a big machine– was getting to go to riverrun cafe for lunch. some 25 years later and i still think about their burgers on english muffins. back then, those seemed like the best to me. wow, riverrun is apparently still open. i had no idea. wonder if it’s any good nowadays. mmm that looks tasty…but I guess cutting back on red meat (and fat) wasn’t one of your new years resolution..
PA, did you grind your own meat? I’m a huge fan of grating onions and garlic.